needless to say, i'm looking forward to blue seven gallery's next offering, a collage based show featuring work by natasha kostan and launa romoff. i found out about launa romoff by doing a google search on collage in L.A. sometime last year, and e-chatted with her briefly and thought it would be nice to pick her brain given the chance. i would like to get her perspective (as well as natasha's) on our chosen medium in this town. it's my impression collage is severely underrepresented here, but maybe i'm just looking in all the wrong places. 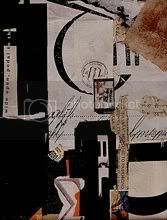 i've seen collage married with illustrative and painterly elements, which encourages me. but, i have yet to find that perfect fit, that place where *i* want to be. this is the life of an artist. the outlook is often grim. many struggle to find their place, not knowing if they'll ever find it. and once we find it, that's STiLL no guarantee for ultimate happiness. until the cat fight broke out over who saw the coolest found object first. RAWR. i still say the vintage eames bar stool i found on someone's curbside was my greatest score. buuuut, finding almost an entire fallen billboard sign was probably a close second. ooooh, you sweet thing, you.